Recently a friend’s husband asked for the keys to my car so he could move it. Later, when I got into the car, the first thing I noticed were the two pairs of plastic Halloween fangs, one orange and one black, that had been in the center console tray for months along with a yellow feathered chick that had been there since last Easter. What on earth must he have thought? It turns out that my car isn’t the only receptacle for vast accumulations of assorted bric-a-brac. 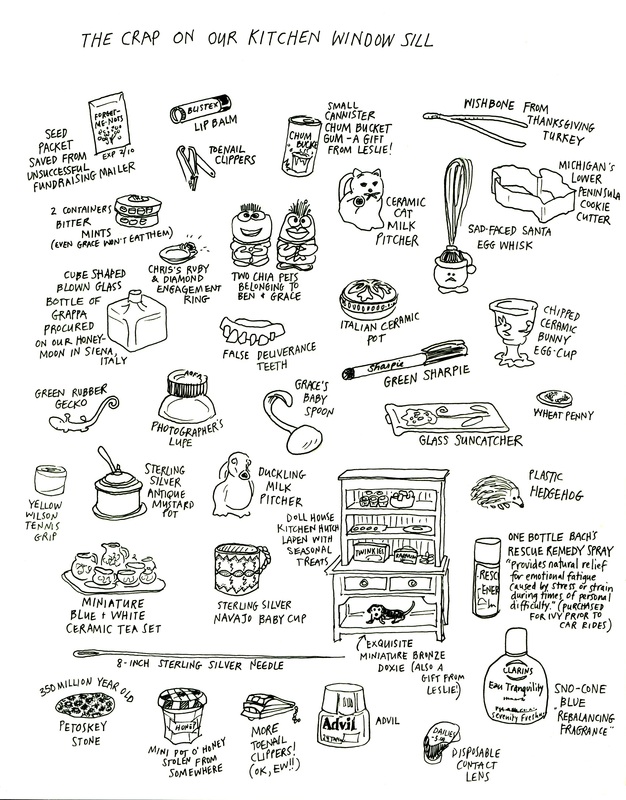 This drawing, done in 2011, chronicles the various items that collect on our kitchen windowsill at any given time. Many items are still there today – the grappa, the Petoskey stone, the sterling silver needle. Other items have disappeared or been culled. For instance, the Chia pet couple went bald and was replaced by a Venus Fly Trap named Shelly and the Rescue Remedy spray was re-gifted to an anxious friend. I will admit it, most of these items belong to me (except the clippers, those are not mine) and who knows what it says about me. I’ve recently considered eliminating such clutter from my life, mainly because we’re about to have the kitchen repainted, but I only entertain such thoughts when on my way out the door, when there’s no possibility of following through on the thought. As they say, a clean stall is the sign of a dead horse.